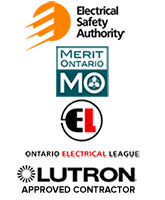 PowerHouse Electric is an ESA approved electrical contractor located in central Toronto. We work exclusively with architects, builders and main contractors to provide a complete range of electrical services for commercial projects. We also carry out electrical work for builders and contractors working on residential new construction, home additions and remodeling projects. Copyright © 2015-2019 PowerHouse Electric Inc. | Complete Electrical Services | Toronto | Tel: (416) 253-7306 | Website by Electrical Web Solutions Inc.